hike to the car was only 45 minutes, and a 10 minute drive to home. Thanks again to all the contacts. Looking forward to next month, work schedule permitting. I operated from the forest east of Moscow, ID using a K2, 7 AHr gel cell, headphones, and a G4ZPY paddle. 20 meters was in good shape so I stayed there the entire time. The antenna was a SOTA Beams Band Hopper II. As is usually the case, the first QSO was with Jim, W1PID. Contacts ranged from nearby OR to distant FL. It was a pleasant evening sitting in the shade of the pine trees and looking out over the forest. The non-radio highlight was a Goshawk flying through the tree canopy. This was my first Spartan Sprint and a chance to try QRP with my new KX3. I started out on 15m and made 2 contacts before the band faded out. 20m was by far the best band for me and I had little trouble making contacts with only 5W. Next time, I might have to drop down to 3W and give that a try. Switched to 40m for the last 15 minutes of the contest and made one contact. I had fun working everyone and look forward to doing this again and getting the weight down on my station. Horrible QRN (S7-S8) on 20m. Surprised and it was fun that 15m was open a bit. I need to do more of these sprints! This was my first Spartan Sprint ever - or in a very long time. I may have done a few 10 years or so ago . . . I can't recall for sure. Rig was a KX3 with internal batteries, tuner and integrated keyer. Antenna was a 135' long inverted-L favoring the east. The QSO's seemed very challenging to get. With so many stations out west and me in Pennsylvania, I may need to go in the field and put up west favoring antenna next month. I need to take the KX3 in the field to initiate it in it's proper use! I can't recall if I'd ever participated in a Spartan Sprint before. I enjoyed the chase and it helps me appreciate what I sound like to DX stations in the big contests. All contacts were made on 20 meters at 1 Watt transmit power, and I did check 40 and 15 meters, but to no avail. Operation here was cut short at 0130Z by nasty lightning storms, so I disconnected everything and didn't come back to the rig before 0300Z. I need to go on a (radio) diet - when my linear regulated power supply weighs more than all the rest of the gear combined, it's time to look into some small batteries. I suppose there's incentive to dig out my NorCal-40 rig and my homebrew 20 meter CW rig - together they weigh less than a pound, I suspect. Hope to put in a full effort next month! There was just a little time to operate tonight between thunderstorms. I used my Yaesu FT-817 at 0.5 watts to a ladder line fed dipole, and made 4 contacts pretty quickly. This included new 1,000 MPW contacts with K7TQ in Idaho and WVØH in Colorado. Thanks to all for a great time. I've been away from this for a while. It was good to get back and work some stations on 40 and 20. I tried 15, but did not find anyone - maybe my timing was poor. I'm experimenting with a home-built DC-DC converter to power a K-1. This used an LM2586 to supply 13 Volts. The input range went down to 3.5 Volts, so I operated at 2 W RF power using 4 Sanyo Eneloop AA batteries. The DC-DC converter weighs 2.4 oz, which seems reasonable. The plan is to take this all backpacking next month. My first Spartan Sprint and first CW contest. Pretty fun! can't maintain that QSO rate for the entire sprint! Oh well, had fun anyway. . .
That was a blast! While on holiday in Minnesota I got a chance to see what the Northlanders experience in HF QRP ops. Well, that little bit of latitude further north is considerable! The signals are just a bit weaker, the fades a bit deeper and you really have to work at getting an antenna up proper. I put up my WVØH Park Portable Doublet at 20 feet and left off my coil and cap tuner and just used the MiniBalun in the 4:1 position. It resulted in a 2.8:1 VSWR. My KX3 antenna tuner adjusted for a mostly efficient match. I started out working K5GQ then K7TQ. NQ2W and N5EM joined in. Then of course an old time favorite of yours and mine W1PID from NH came bursting onto the scene. Back and forth, TX then the northeast, TX, Northeast back and forth. W5ACM of course probably running a 1-ounce rig running 30 Qs an hour will no doubt place. Then the usuals, N1DN, AB9CA, and WA8ZBT were strong contenders. 1 watt signals from K8CN, K4JPN, and N1DN were impressive. My sister in law was standing over my shoulder at the time truly impressed by the beep strength as she put it. Nineteen QSOs were had on 20m and none on 40. 40 just seemed dead and noisy, so no joy there. Next month, I will be back home and hopefully won't forget the event. Thanks everybody for a great vacation break from "up north" where beep strength matters, the women are strong and the children are all above average. Keep your stick on the ice. Tough night for the bands in New England. Only made contacts on 20 meters. Also had to quit early due to t-storm. Still, fun as usual. KX1 on internal batteries (3W at best) to a 63' end fed that's resonant on 40/20/15/10. 20 meters was the only active band. Best DX: RX9JX, NK6A. K5GQ worked the hardest to pull me out! Thanks! Operated about a half an hour. K2 OCF dipole. Thanks all. A good sprint! Ran the K2 at 5w to 100' wire. Got another late start by about 20 min. Started on 20 as it is Staying open later. Logged 22 there, including a couple of EU stations, before moving to 40. Logged 15 there. Finished with the last 10 min on 80 and logged 2 there. QRN was pretty bad, even on 20. Only the loudest were able to get through on 80. WA8ZBT, N5EM, NK6A and NQ2W were two-banders. No three banders. My RBN spots say that 20m was open and long. Quite a few 5w spots from the EU. Thanks to everyone that stopped by and to KI6SN for doing all the work! See everyone next month. Back in PA for the summer and enjoying the ‘power’ of an outside antenna and no HOA Restrictions up here in the sticks. Hi Hi. Sprint seemed to start slowly and build. Big signals heard tonight included NQ2W & WA8ZBT. Dennis, followed you to 15m, but no go. Thanks for the fun and nice contacts. See you next month. Thanks for the QSOs, and 72. Having trouble with ATS-3 audio very weak on 20M but OK on 40M. N4BP called me on 20M and had trouble hearing the signal. The audio is very low. Bands were in reasonable shape. Worked 3 stations on 2 bands and one station on 3 bands. Be back next month. Hope for more stations on the air next month. I had a brand new set up for July's SP. I built the latest Mountain topper radio from Steve; KD1JV. It's a 3 band version for 30,20,and 17 mtrs. So I went single band - 20 meters. It's the size of a deck of cards but weighs less. Key is a whiterook paddle and used a 370 mah lipo. Put up my temporary backyard full wave delta loop for 20 meters and it tunes 1.1 to 1 on cw. So I can now ditch my T1 tuner for the evening. Radio is a real battery miser. Lipo 3s starts out at 12.4 volts and after 2 hours I still had 11.2 volts showing, which is the lipo's sweet spot. Still running 4.6 watts at contest end. LOVE this radio! Weight breakdown: Radio 4.32 oz; Key 1.44 oz; Battery 1.44 oz; Total weight is 7.2 oz or .45 lbs. I made 14 contacts. Best DX was NK6A in CA. Heard a 9A station but he was hit and run. Propagation was nice into Florida. Worked Art, WB4MNK, @ 4w and KG4GVL, GB, @ 1 watt. Thanks again for a FUN evening. Think I'm going to look for a smaller battery. Hi! Sure enjoyed using the little KX1, ear buds, ZM-2, Lipo battery and the tiny Dirt Cheap paddle. Fun event and thanks to all I made contact with. I had the KX3 running on internal batteries. The rig's wide range internal ATU works very well on my CFZ antenna. Almost all activity was on 20M. Only heard a couple of stations on 40M which was filled with moderate QRN. After the sprint was half over, I didn't hear many stations, so I suppose most ops had given up. Also my cat was sitting on my logbook, staring me in the face, so I quit. It was really great to spend some time on 20M this month. The locations I worked from Houston were as far NE as N7UN in NJ and SW to NK6A in CA. I still have a small issue with 40M reception and the contacts on the keyer paddle. Only five QSOs on 40M, but FOUR of the FIVE were in Texas! Lots of activity down here! I will keep working on the paddle contacts. I cleaned them twice during the event, but there were still problems. The two 170 mAh LiPo batteries did quite well, but the power output with a nominal 7.4 VDC is 3 Watts, and once again started dropping just after the first hour. I was probably around 2 Watts toward the end. 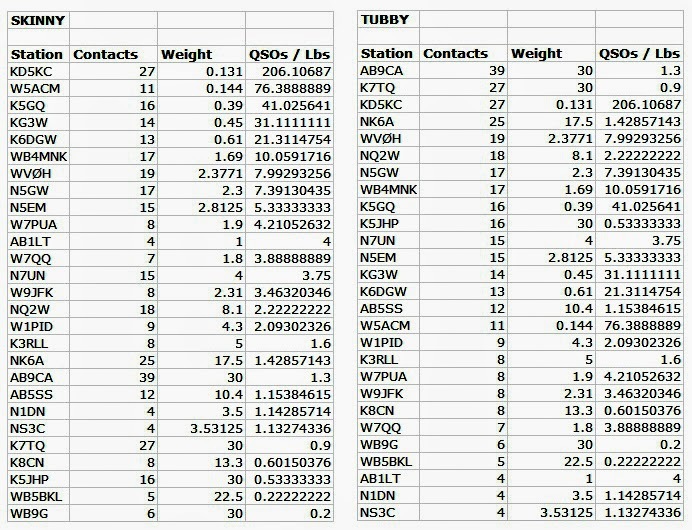 QSOs: 13; States/Provinces: 7; Weight: 0.61 lb. Radio: KX1 [40/30/20] with ATU and paddle; Ear buds; 750 mAh Li-Poly battery. Antenna: Alexloop. Location: On our deck, Auburn CA. K1 at 5 W to a 2-element mini-beam at 25 ft for 10, 15, and 20 meters and an inverted V at 40 ft for 40 m. I started out on 15 m and was able to work NK6A. I moved to 20 and was privileged to make 8 QSOs. Then to 40 for 9 more. The QRN on 40 was problematic. Thanks for the repeats. Doubles with NK6A (15 & 20) and WB4MNK and AB9CA (20 & 40). Good to work K3RLL in PA! Thanks for the contacts and thanks to the organizers. 20M was not as good as June, but still managed 5 Qs. It seemed activity was down this month, but that might just be conditions here. Thanks to AB9CA for pulling me out on 80M near the end.